Is there a better alternative to Ockham? Is Ockham really the best app in Science category? Will Ockham work good on macOS 10.13.4? Ockham needs a review. Be the first to review this app and get the discussion started! Ockham needs a rating. Be the first to rate this app and get the discussion started! Ockham is an innovative app for performing rigorous sensitivity analyses for a high number of parameters of a mathematical model. Sensitivity analysis is a crucially important tool for assessing and validating complex process models and to identify the most important drivers in these models. 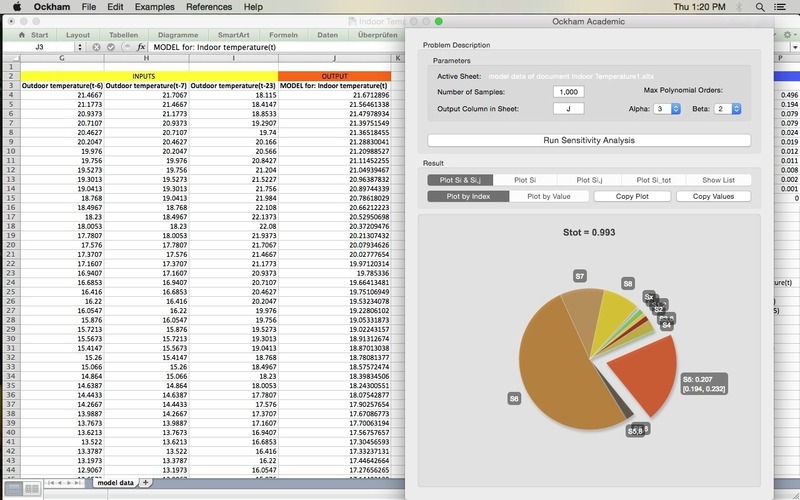 Ockham reads input and output data representing a mathematical model in an open Excel worksheet to perform a global sensitivity analysis of the model. Its new and original approach to global sensitivity analysis considers both single parameters and interactions between model parameters as a more complete, more accurate, and safer assessment of uncertainty than 'one-factor-at-a-time' approaches used in other software. Ockham is based on self-organizing analysis concepts, and it is designed to be a valuable tool in academic research and for private users, primarily. It allows without special knowledge in sensitivity analysis to identify most important drivers of models most objectively and easily from a small set of observational data. Determines the influence of not only single parameters but also their interactions.